I’d wanted to describe how these two characters from my creative process for fiction-writing became transverse in the sense of otherreal and surreal, and because one character had taken years to cross over (and only then, an appearance in a dream) I thought they would have been months apart. I thought that I would have noticed immediately if these characters came forward in tandem, which they did mid-September 2014. Pictured below in the violet gown is Lady Vanda. Her fictional origin is a love interest that I made for a princess, that I conceptualized in 2007, and up to now the character’s name still eludes me, so I’ll just refer to her as Fictional Vanda. I could see Fictional Vanda clearly: swarthy, with silky raven-black hair that she wore long because she was that good with a sword that no one could come near her or take her by surprise, and she would always wear a white tunic and breeches and boots. She was a squire. Not only had the knight whom she had apprenticed under died in battle, but the entire civilization that would have had them both as part of their military completely collapsed, before Fictional Vanda could complete her apprenticeship. It wasn’t until 2012 or 2013 that I had any idea about her childhood, which was basically that her mother and her mother’s husband had an arranged marriage, and arranged between themselves that they wouldn’t necessarily consummate with each other. Fictional Vanda’s mother died in childbirth, and she was raised by two fathers who had fallen in romantic love with one another. Ironically, her mother’s husband was the one to grow a paternal affection for Fictional Vanda, whereas her birth father was quite neglectful and distant, being far, far more interested in his lover (that is, his ex-lover’s husband) than his child. In writing the courtship and romance between Fictional Vanda and the princess, I felt troubled that I wrote Fictional Vanda as only taking the stereotypically masculine role. I had a dream about her. I had seen her so clearly in my mind for years, even though the name continued to be difficult to catch and I wanted to change the personality. In the dream, I was in a restaurant at a mall and my ex-mentor in psychism bought me a meal of fish meat. I objected that this species of fish was endangered, he said that it was fried (implying that I couldn’t resist fried food, but I was unmoved) and that it was boneless (which actually did tempt me enough that I ate.) After one bite, though, I told him and Miasma both to quit “helping” me because they didn’t know more about my life than I do. When Ex-Mentor in Psychism told me in reply that I was wrong, I told him, “No. You are.” Then I strangled Miasma to death, and Professor Snape from the Harry Potter series was there to remind me that Miasma had a job at the mall, and I went outside to find that the exterior was a temple or cemetery that I had dreamed of before… those bizarre dream things. The numinous part of this dream took place in these indoor marble ballrooms. I was going to see my mother, who’d had me fostered among humans. She wore a gown that was somewhat like a toga, made of some lustrous purple fabric, and was occupied with arranging flowers in these marble vases or pots. Of course, she otherwise appeared like Fictional Vanda in her face and build. When she saw me, Lady Vanda expressed a dissatisfaction with how I grew up being fostered, and suggested having me “spirited away” again. I told her that growing up human had indeed been awful, but we were past that point so a second fostering was unnecessary. I can’t remember any exact words, but she spoke to me reasonably and firmly. She expected me to trust in her decision, and, in the dream, I did. Lady Vanda was a name that I thought up of later, after I had woken up and run purple flowers and orchids through a search engine, because I wanted to keep the flower name theme with my imaginary friends. While she looked identical to Fictional Vanda, certainly the dress, the evident status, and even the personality was completely different. Fictional Vanda was a rough-and-tumble tomboy, alternating between bleak brooding angst and frequently flirtatious banter, a rogue by necessity but a knight at the drop of a boon by the wise clerics or the honorable royals. Oh, but it was just a dream. I just like it an awful lot, the idea that I was the daughter of a fairy noblewoman all along, and that there’s a living entity running in my mind who isn’t Caucasian*, but I doubt this will go anywhere. Lady Vanda’s obviously got a hands-off parenting style, anyway. * Because, I swear, almost everybody else in my mind is. They’re supposed to not even be part of the human race, but if they’re humanoid, they’re white. Except for Lady Vanda, this one time. That’s how I’m sure that this is all a product of my kyriarchally-conditioned subconscious mind. Pictured below is Captain Marigold, whose fictional origins were far more recent, early to mid 2013. This character was inspired by the historical figure Grace O’Malley, because I like the idea of somebody having lands and titles and having to play the political game and yet still doing pirating. The historical figure, I believe, had dark hair and gray eyes. 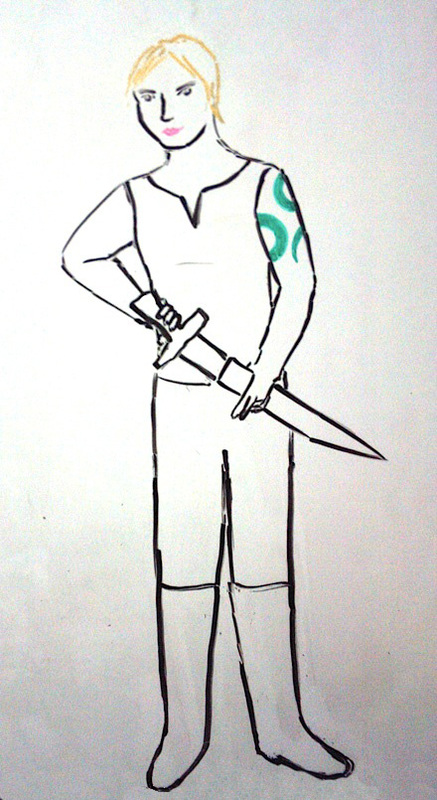 My mind gave me, instead, a woman with wispy pale blonde hair and some green tattoos on her arms. Gray tunic, sleeveless; gray breeches, black boots… wow, my mind’s warriors have such a varied and interesting fashion sense that is surely otherworldly and wildly imaginative. Shouldn’t Fictional Vanda have some sort of plate or leather armor? Captain Marigold moonlights as a pirate, why wouldn’t she have a bandana or a parrot or something? Okay, tattoos. Tattoos are cool. I could never quite see what they were tattoos of, but if they’re dragons then I could possibly consider this character more influenced by Princess Alfhild than Grace O’Malley. The day after the dream described above, I was walking back to the boarding house I live in, from a Saturday afternoon at the mall with my corporeal friend Anjie. A paracosm isn’t difficult to juggle. At the same time that I was walking, part of my attention was in the Surreal with Foxglove. I was in some sort of courtroom, and Foxglove was cross-examining me. At some point, Marigold interrupted, just as I imagined she would appear, and that is why she is in this entry. I feel that Marigold represents a purpose more specific than my imaginary friends, and certainly more than the entire cast of fictional characters who don’t cross over into directly interacting with me. Foxglove, for instance, represented emotional healing, stress tolerance, romance and sexuality. I did not know this when he first came to mind. I just thought that I’d hear him out and respond however I would. Marigold, being both a noblewoman and a pirate, far more functionally and authoritatively than Fictional Vanda could ever manage (Fictional Vanda being a lapsed or exiled courtier, and a would-be knight in the service of a lost civilization) I sense represents honor and duty. Marigold would play the political games, know the laws, the economics, and the courtesies… but she knows that isn’t enough, that there’s an anarchic world outside of the bubble of civilization that she considers important to dabble in. Or more than “dabble”, otherwise the civilization bubble would burst in the collision with the anarchic. Where Foxglove is purely anarchic, Marigold is more tempered. With those values and notions associated with Marigold, she’s become a figure for me to admire, even deify, although I also have not seen very much of her since that day, I suppose that I could just keep the notions, much like I have with The Lady of Shalott.